Our expert cottage cheese ceiling removal in Brea CA eliminates an eyesore and a health hazard from your property. If you have cottage cheese ceilings in your home, you may feel like cursing the original builder. Why on earth would they have chosen to include such an eyesore in their design? Well, for many years cottage cheese ceilings were fashionable due to their many practical benefits, such as muffling sound and making ceiling cracks and stains less noticeable. The real problem is that, besides being ugly, some cottage cheese ceilings were made with asbestos-containing materials. This means they could harm your health, unless you get professional cottage cheese ceiling removal in Brea CA. With asbestos, it’s not so much the quantity of material that matters as the frequency of exposure. This means that you cannot afford to ignore even a small patch of damaged cottage cheese ceiling, as it could produce enough asbestos fibers to make you sick. The good news is, you can protect your health and the quality of your indoor environment with AQHI Inc.’s professional cottage cheese ceiling removal in Brea CA. 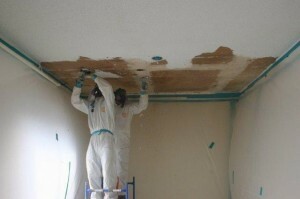 Need cottage cheese ceiling removal in Brea CA? Rely on AQHI Inc. for a fast and effective cleanup. For a free estimate or more information, please fill out our online contact form or dial 800-481-8080. Our asbestos removal office for Cottage Cheese Ceiling Removal in Brea CA is open Monday through Friday between 8:00 AM and 5:00 PM and closed for lunch from noon to 1:00 PM. With advance notice, projects can be scheduled for weekends, early mornings and evenings.